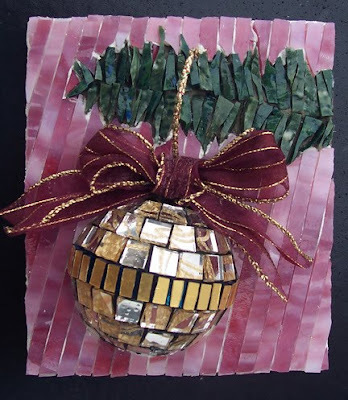 Margo Anton's Mosaic a Day: "Happy Holidays"
This is my sign off mosaic for the year, so that I can enjoy the holidays to the fullest. I'll be picking up the project again in the New Year. From a technical standpoint, it was interesting to use the strips of stained glass as the background--may have to try this again. Also, this is the first (and possibly the last) time I've used hot glue in a the construction of a mosaic. Thanks to everyone for following my crazy project and blog this year. I'd like to wish everyone a safe and very happy holiday. WOW! Just beautiful, Margo! With every piece, you continue to impress and amaze... well done! Love the ribbon - excellent finishing touch! I look forward to following your blog again in the New Year! Merry Christmas, girl!